This is probably York’s most complained-about eyesore, as previously discussed. It was built in 1912 (though designed to look medieval) so this year must be its centenary. Perhaps in honour of this fact, plans are at last being put forward for its refurbishment. Plans with drawings, going on public display. A recent article in The Press included the sketch of how the owners suggest it might look. Basically the same as it looks now. Its exterior anyway. And the exterior is the only bit most of us care about, as we haven’t been able to see the inside of it for more than twenty years. 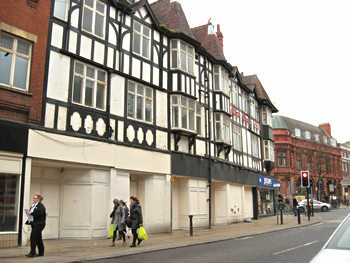 The owners’ original suggestion that the site might be completely redeveloped – with the building ‘torn down’, as headline writers always phrase it – provoked much complaint. Many people recognise how good it looks on that corner, how well it blends in, and that it was once rather handsome. It would appear the owners listened and plan to retain the existing frontage. Which will perhaps keep everyone happy. That would be nice, wouldn’t it. One of the comments on the story in The Press suggests that the building is listed. I don’t think this is correct. It is on the Local List (www.yorklocallist.org.uk), but this at present appears to give no protection. Though it is worth a look at, as it includes many buildings we locals admire and value. For more, see Alison Sinclair’s letter to The Press on 22 November 2011. The plans for the White Swan Hotel will be on display from 2pm to 8pm on Wednesday 18 July, in The Penn Room of the Friends Meeting House, Friargate.